When World War Two-era watches are mentioned, many a WIS thinks immediately of high-quality German-made B-Uhren and chronographs. 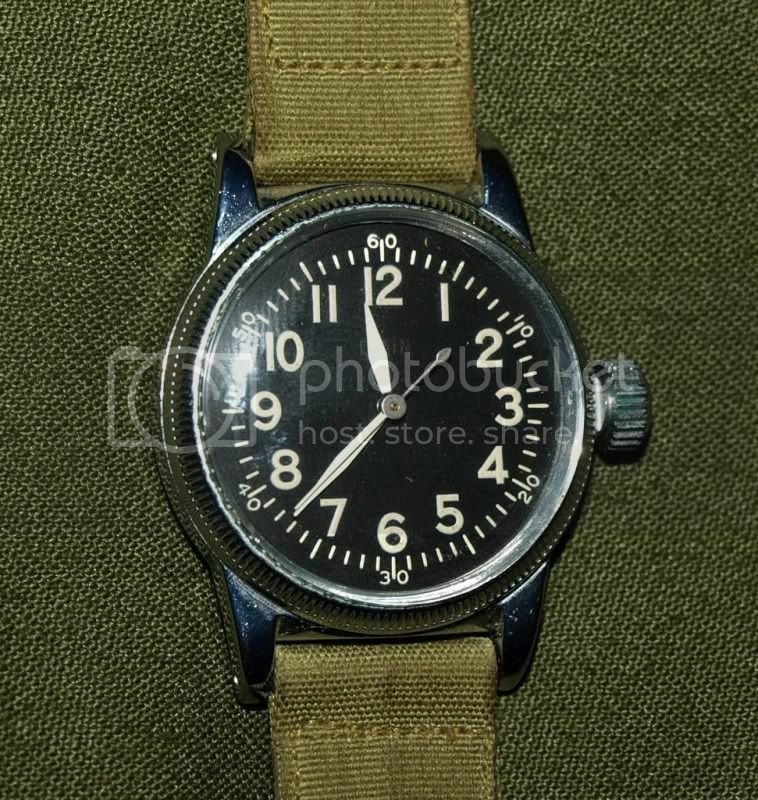 But it was a comparatively small, unobtrusive, mass-produced American watch, the so-called "A-11", which has a claim to fame of having made a crucial contribution to the Allied victory in that war. This is the watch that kept the United States Army Air Forces (from 1947 on known as the "US Air Force") as well as the Navy and Marine Corps flying, and - to a lesser extent - the RAF (under the 6B/234 designation), the RCAF and even the Soviet Air Force. The A-11 was there when Germany was bombed and the World War II in Europe was turned around, when the war in the Pacific ended in the first - and so far only - nuclear explosions in anger occured, and when the monumental effort of the Berlin Airlift turned erstwhile foes into friends and allies, and handed the Soviets the first resounding defeat of the incipient Cold War which their political system, and their empire, would not survive. The A-11 was superseded at some time - usually the Korean War is given as a time reference - by the all-lumed A-17. 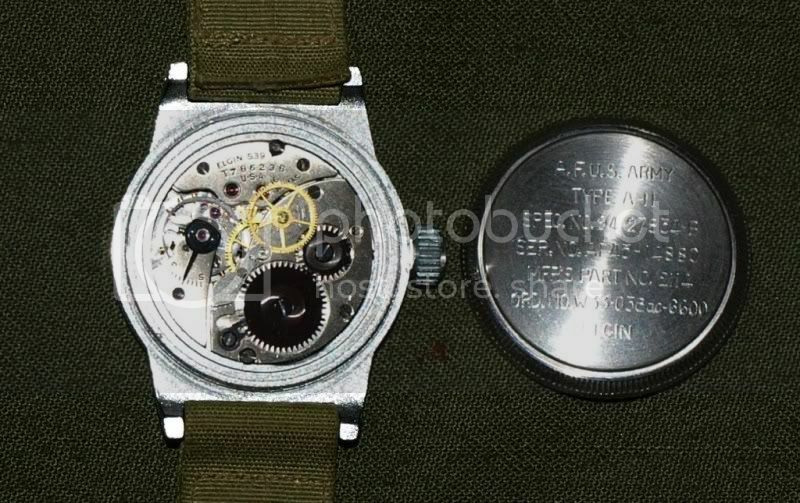 The A-11 was not so much a specific watch model but a production standard used by a number of watch companies (Elgin, Bulova and Waltham), with numerous case and minor dial/hands variations (there were even silver-cased watches, as nickel was considered a metal more critical for the war effort! ), though some design aspects were largely universal: Black dial; white hands; a handwound hacking movement with center second hand, hour numbers from 1 to 12; a second scale with smaller minute/second numbers in increments of 10 on the outside edge of the dial; and same-type minute and hour hands. Several A-11 versions featured a characteristic coin-edge bezel and caseback. Some were dustproof, others were waterproof. 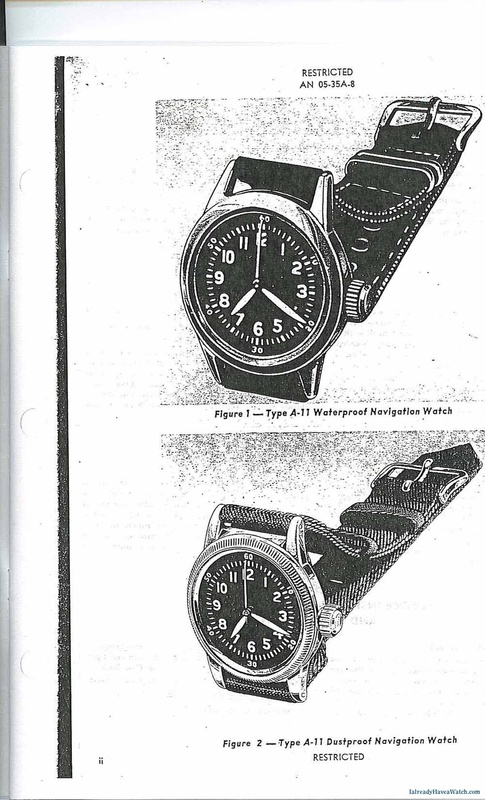 There are several design elements of the A-11 which are still present in today's US military issued watches, viz. 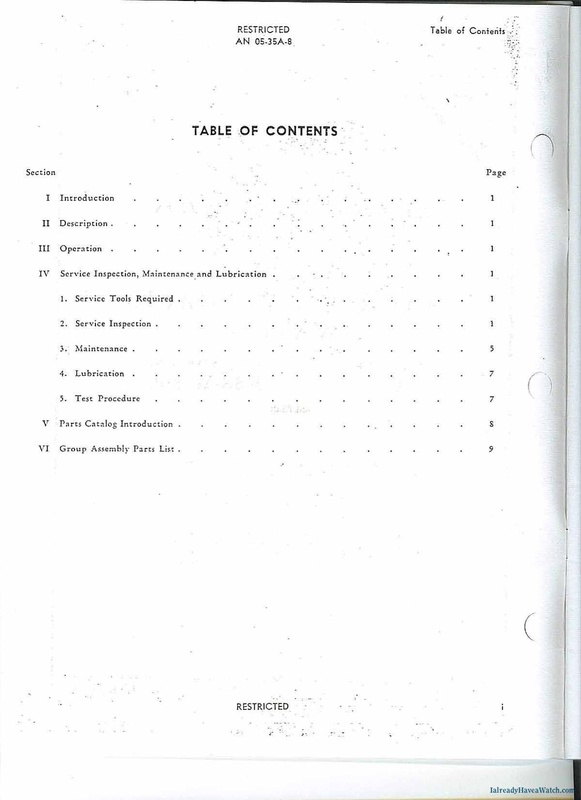 the full 1-12 numerals, and the preference for the same type of minute and hour hands. Even the basic accuracy requirement for the A-11 (30 seconds per day at room temperature) is still the same for todays American mechanical milwatches! While previous to the A-11 designation some issued watches were made with white dials, this changed after 1942 to the black dial version that is better known. 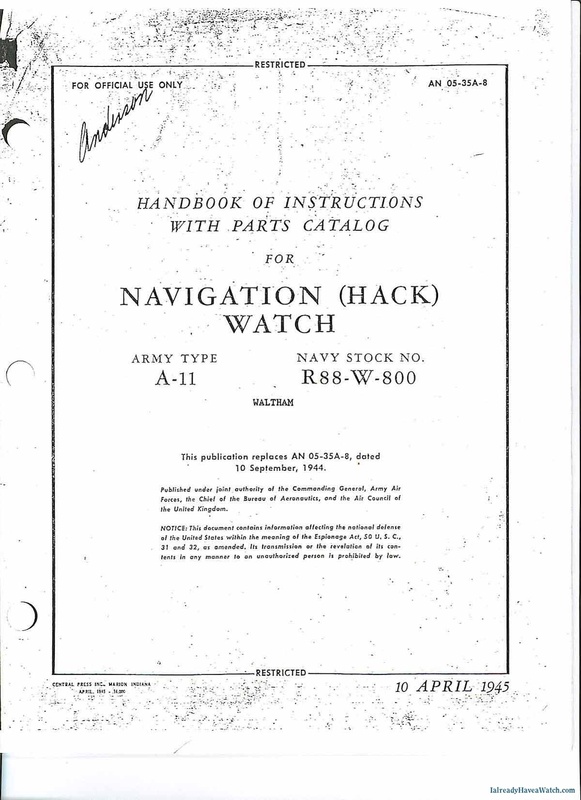 Any white-dialed watch would be issued prior to the A-11 specification, most likely in 1941. There were at least three A-11 versions made. As mentioned, Elgin, Waltham and Bulova made various incarnations of this classic watch, but the "official" version is the Elgin, as documented in TM 9-1575 from the War Department. 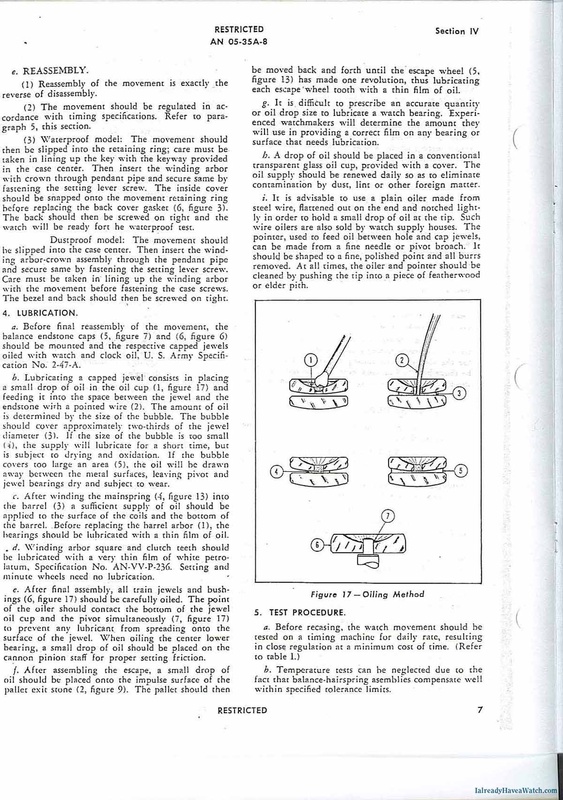 This is the ordnance maintenance guide for wrist watches, pocket watches, stop watches and clocks, from 6 April 1945. The A-11 movement is an 8/0 size: what does this mean? It's in terms of the Lancashire gauge, and refers to a caliber that is 23.71mm in diameter, and the slash refers to a watch that is smaller than a 0 gauge watch movement: in this case, a watch that is 28/30th of an inch in size (hence the 8/0 reference). This isn't the first Elgin military watch: the others were 7 and 15 jewel movements with sub-second dials, and there were at least one "canteen" style watch made with the same 16-jewel movement for the US Bureau of Naval Shipping that were amongst the first diver watches out there. Now here's a point which is somewhat unclear. 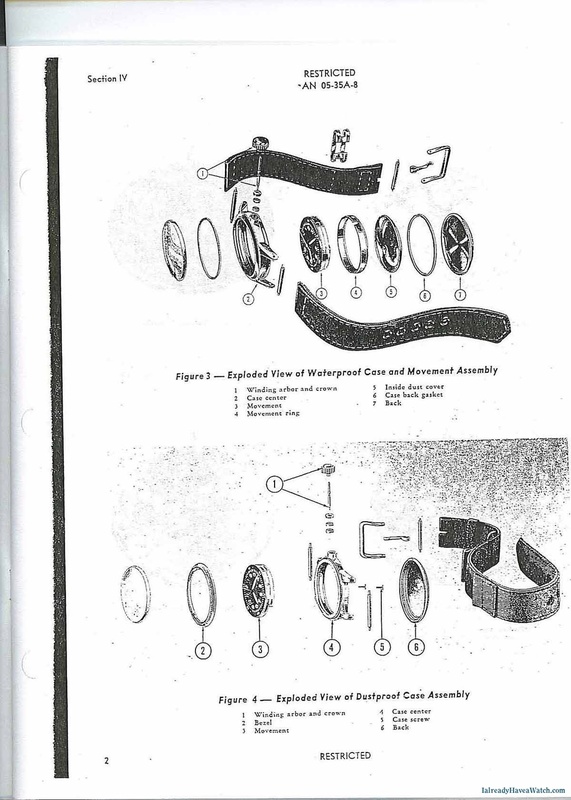 The 8/0 movement that goes into the A-11 was to be a 16-jewel movement, but where did they get that number? Further, what about all those A-11s out there with 15-jewel movements? 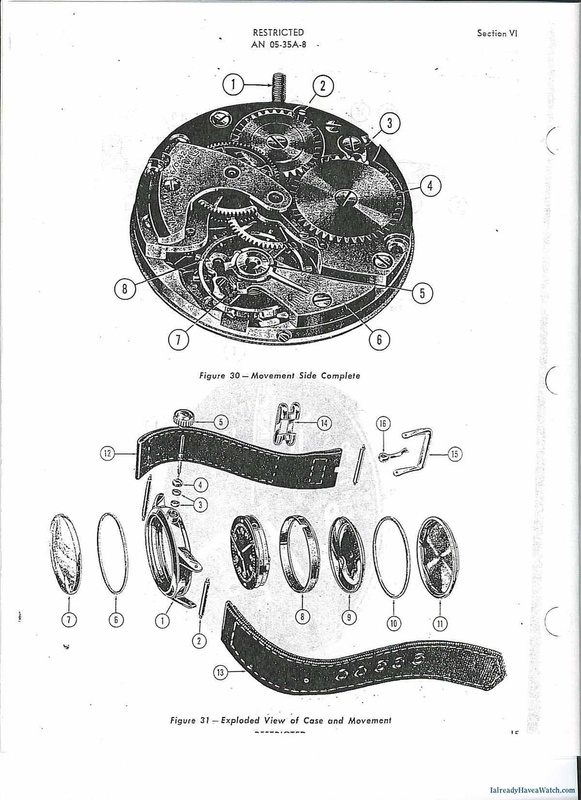 According to the TM 9-1575, it is a 16-jewel movement. The other A-11s with 15-jewels, though, aren't necessarily fakes: it just that they may have had a field-expedient replacement (i.e. 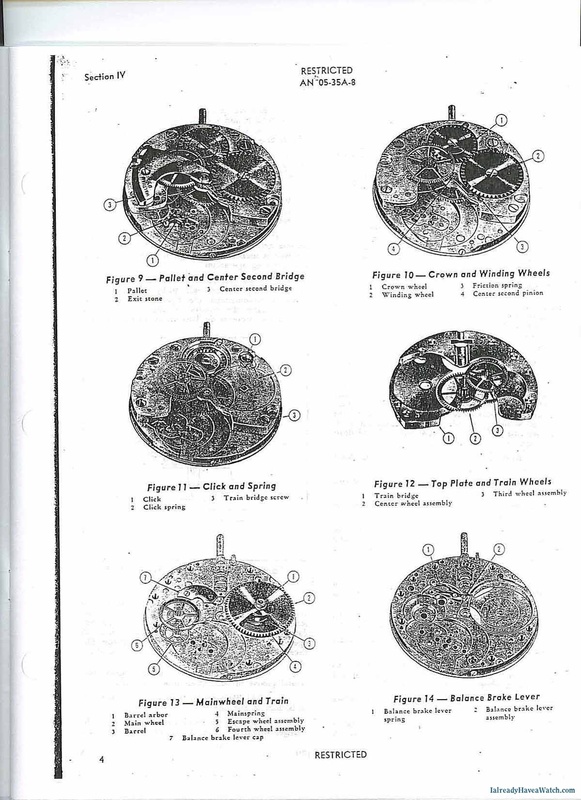 the movement was replaced by a 15-jewel engraved movement that has had the pinion bridge added to that) or there may be some other, undetermined reason. But what's the key attributes of the movement that make it unique? Well, first and more fundamentally it's a watch with a sweep seconds hand that also hacks. The exact model of the Elgin movement is a 1783 model, grade 539. Elgin pocket watch movements were generally graded according to different degrees of finishing and quality, and hence this odd designation. It's generally just called the 539 movement. 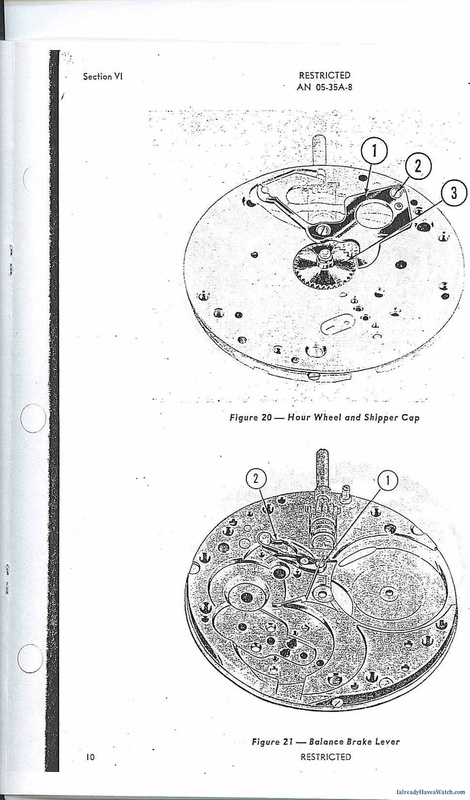 The addition of the sweep second hand meant that a hollow center wheel pinion was added to the watch with a sweep second pinion bridge and an upper third wheel. The barrel bridge was drilled and tapped so that the pinion bridge could be added. The third wheel pinion was longer to accommodate the upper third wheel. But what is the base movement then? 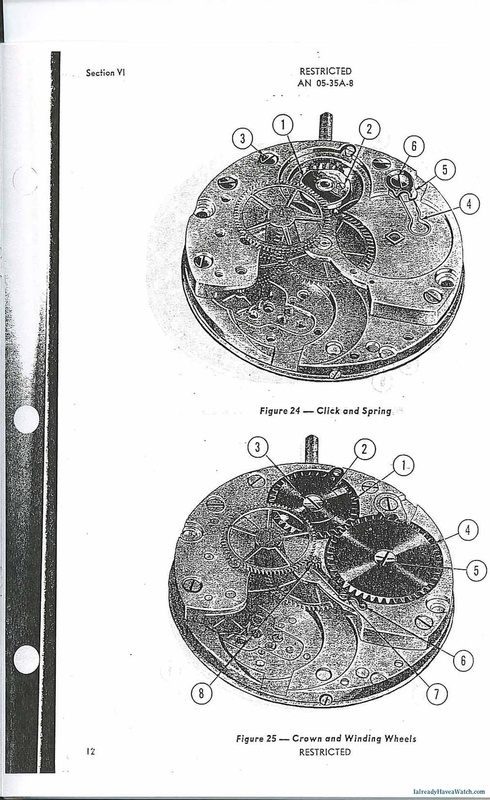 It's the 15-jewel movement that was used in other Elgin military wrist-watches. This is what the TM 9-1575 has to say: Three Elgin models have been issued, all 8/0 size, having 7, 15 or 16 jewels. The 7- and 15-jewel standard watches are the same in construction, the difference being in the number of jewels and the ordnance markings on the exterior back of the case. 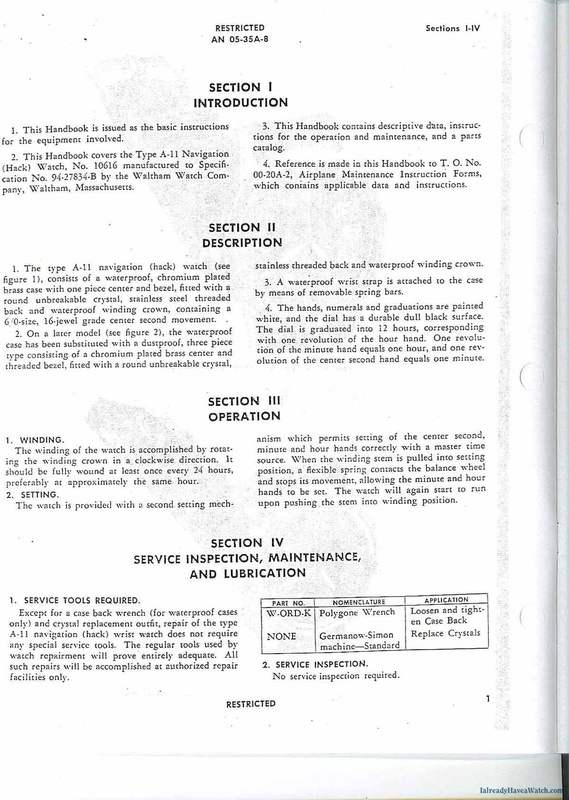 The 7-jewel has the markings "OD" before the serial number, and the standard 15-jewel has the prefix "OC" before the serial number (nb: my copy of the manual has a pencil-written correction to this reversing the designations...). The 16-jewel (Hack) Type A 11 differs from the standard Elgin wrist watch in that it is equipped with a waterproof case, a sweep second hand and a black dial. Although they are normally issued to the Air Corps as a navigation watch, some have been issued, however, to ground troops. 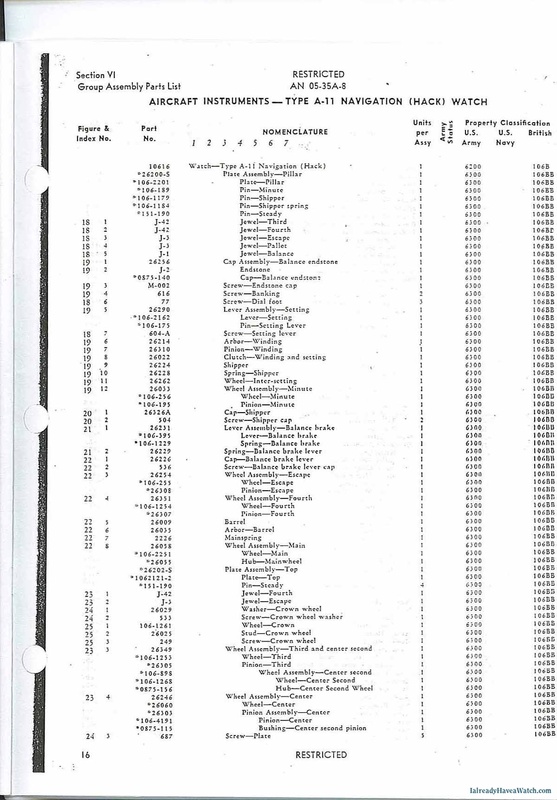 The ordnance marker has the prefix "OFA" before the serial number. ... The hour dials are graduated in minutes and Arabic numerals indicate the hours. The second dial orbits are graduated in seconds, with 10-second divisions indicated by numerals. The hour numerals and the hour, minute and sweep second hands are coated with a radium luminous material for night use. The second hands are all of blued steel. The movement that was in the Elgin military watches is hence always the 1783 movement, but with differing grades. The movement with the sub-seconds was the 554 and forms the basis for the 539 movement: as mentioned, the sweep central second was added. The dial differs only in that the markings of the seconds are not around the sub-dial, but around the rim of the watch dial, marked at 10-second divisions. The upper third wheel drove the sweep seconds hand directly from the back of the movement. The 16th jewel, from what I can see, is in the the sweep seconds pinion bridge. There are two important aspects to the movement: first: it hacks. 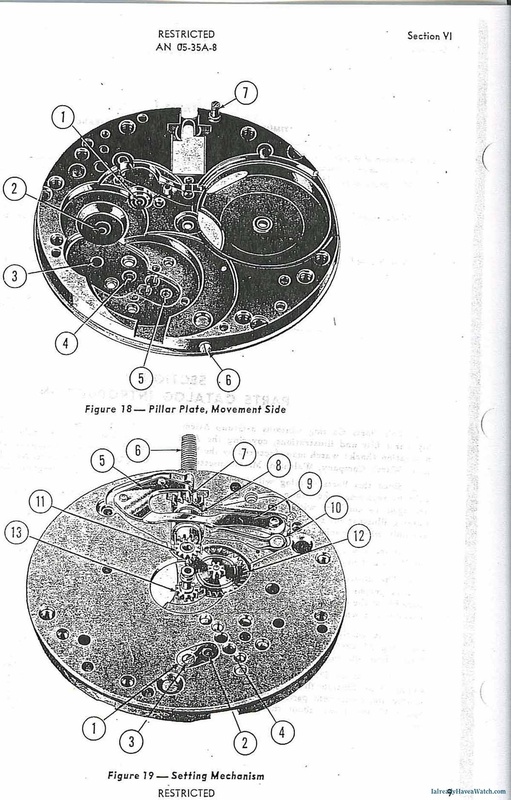 The hacking is interesting because the Elgin hacking entails that the balance wheel is mechanically stopped from swinging back and forth in order to stop the movement of the seconds hand in order to synchronize the watch with a known time source (which was usually either a squadron chronometer or some equally high-quality movement, or may simply have been the squadron's commander's watch so that everyone was using the same time). From what I've been able to glean, the Bulova and Waltham hacking movements used a piece of metal to stop the third wheel instead. Second, it is a high-quality movement that was as good as any movement put into an American military watch. The 16 jewels underscore this. The dial is black, with very high visibility white-on-black numbers and graduations; the hands are also designed for high visibility, with a clearly smaller and wider hour hand, a longer and significantly slimmer minutes hand, and a long and thin constant width central sweep seconds hand. The design doesn't have any particular flair or a particularly aesthetic layout, but is simple and designed for easy reading of the time. Now, the Bulova version of the A-11: this was the watch that was issued by the British as the Mark VIII, with an A. Schild SA Cal. 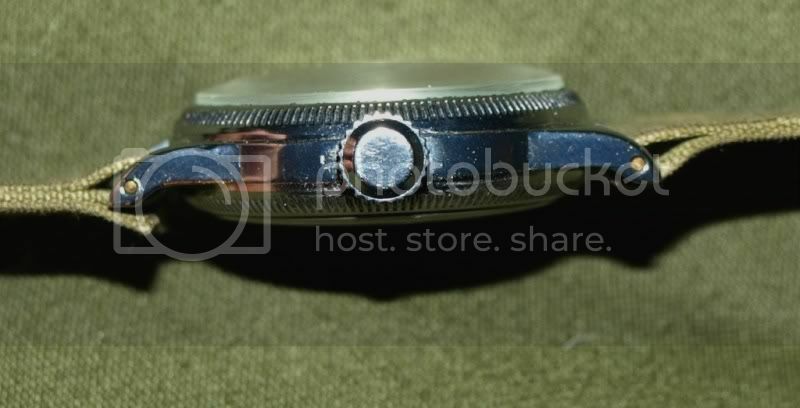 1238 movement (10.5'''), which while basically a Swiss movement was actually built in the US by Bulova as the cal. 10AKCSH, which also resulted in the lack of "Swiss Made" on the dial. The name can be parsed so: cal. 10AK, CS = center sweep, H=hack. 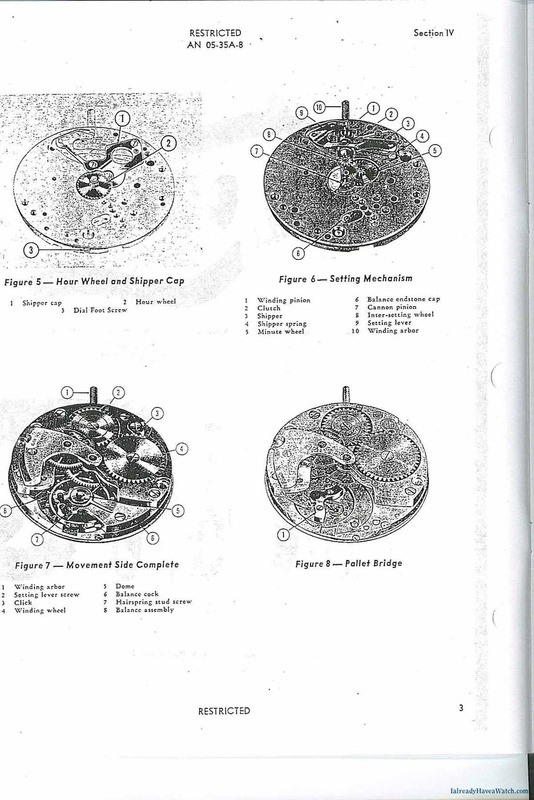 The case here was chrome-plated base metal with a screw-on stainless steel back, and there was an inner magnetic cover made of Invar, which is an iron-nickel-carbon-chromium alloy. This movement also hacks and is also a 16-jewel movement that mirrors the Elgin movement transformation of a 15-jewel movement with sub-seconds to one with a central sweep second via a new pinion bridge. The bridge here also attaches to the mainspring bridge. 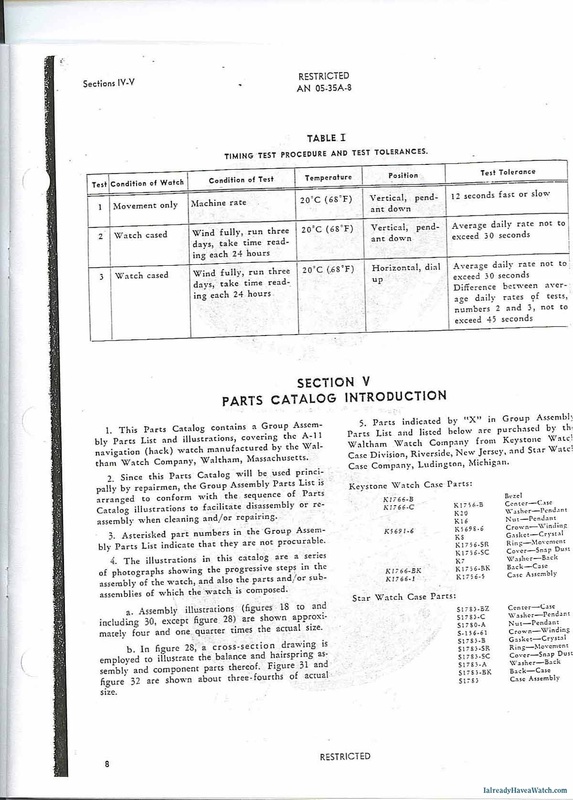 The Waltham version used a 6/0 size movement, i.e. one 26/30th of an inch in size, based on a 15-jewel movement (cal. 884? ), but with the addition of the central seconds via the additional pinion bridge the jewel count goes to 16 as well. 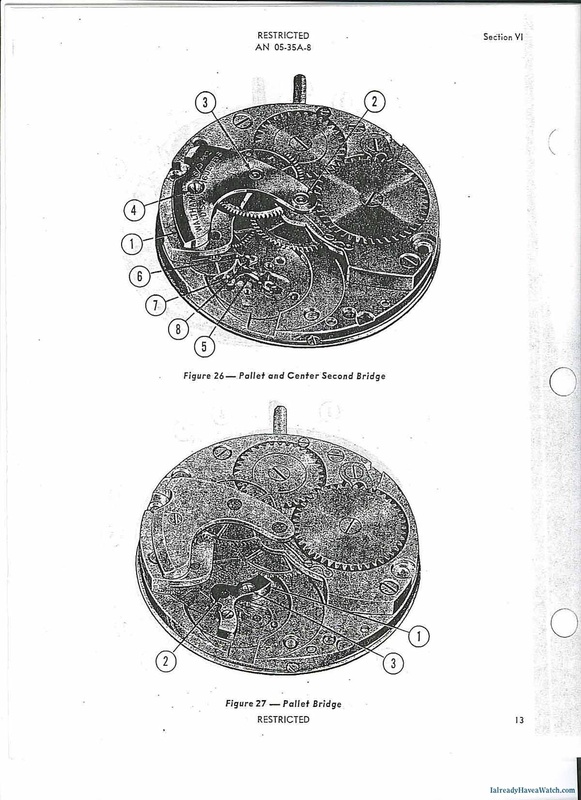 Given that the movement was smaller, so were the cases as well, despite their belonging to the same specification! 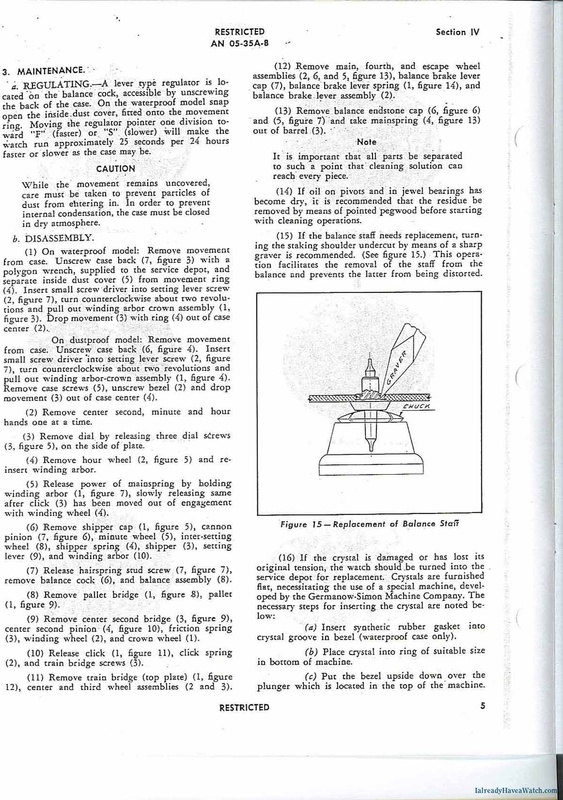 Fundamentally, the mechanical side of the A-11 included really only two criteria: the addition of the sweep second via a pinion bridge and modifications, and the hacking mechanism. Elgin, Bulova and Waltham did the details slightly differently, but all fulfilled the fundamental demand: create a mass-production, good quality mechanism to power literally hundreds of thousands of watches with minimal costs and a high degree of functionality and readability. It was indeed the wristwatch that helped win the war. Patrick_Ethan, busmatt, J C and 6 others like this. Please use this thread only to comment on the historical or technical aspects of the A-11. For details of the homage project, and for signing up for the Watchuseek limited edition, please go to this thread. All three of these movements share one weakness, the bearings, both upper and lower, for the center (or second) wheel. Due to the rather large lateral force exerted by the barrel, these bearings will wear on one side more than the other making the round bearing hole egg shaped. This allows the center wheel to translate laterally. Normally, this would have no effect on the ability of the movement to operate, or keep good time, however, because the second hand pinion is held rigidly in a fixed location relative to the bridge by a jewel (mandated by the specs), the wear of the bearings will allow the center wheel axis to move laterally away from the centerline of the second hand pinion (as defined by the jewel.) Once this reaches a critical distance the second hand pinion will bind, bringing the movement to a dead stop. 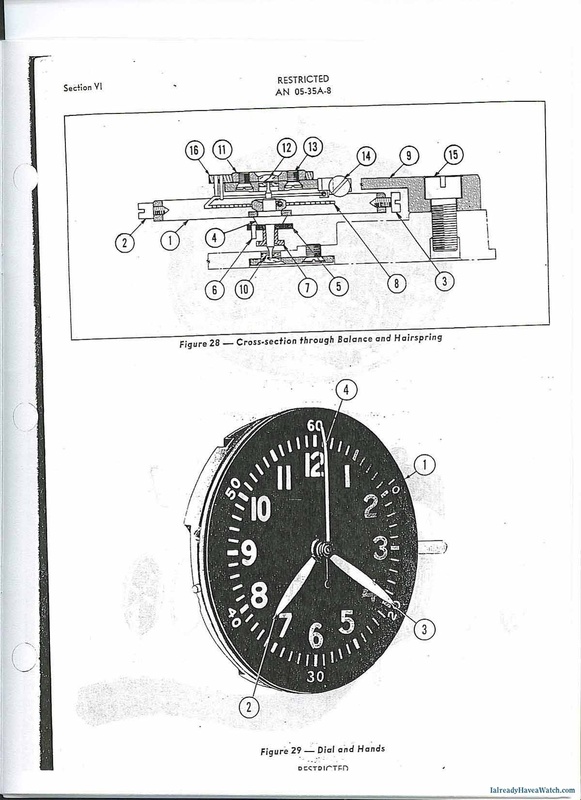 In the Waltham watches, this problem is a fatal one, as there are no bearings to rotate. The Waltham movement has the more primitive, and cheaper, plain hole in the mainplate and bridge. 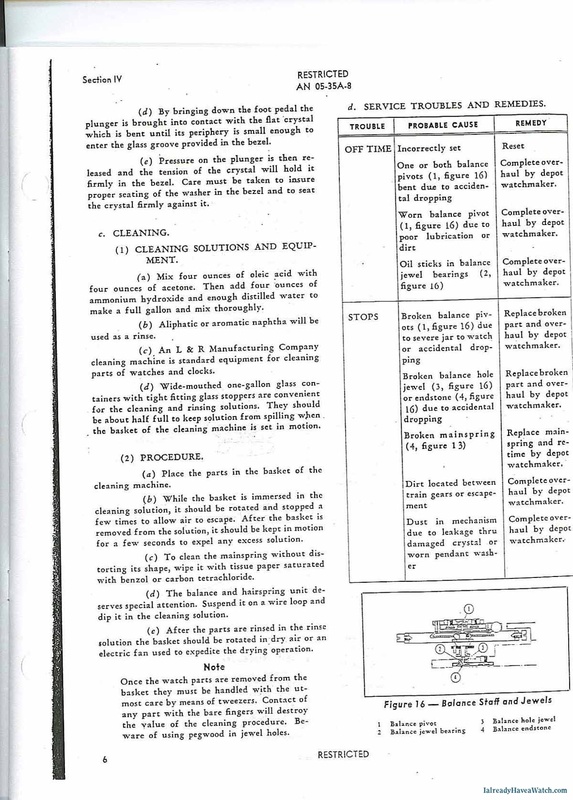 The Waltham also used an aluminum barrel that is prone to crack at the groove for the mainspring enegagement. That's easy, the specification mandated two things, 1) a 15 jewel movement, minimum, and 2) a jewel for the rear of the second hand pinion. 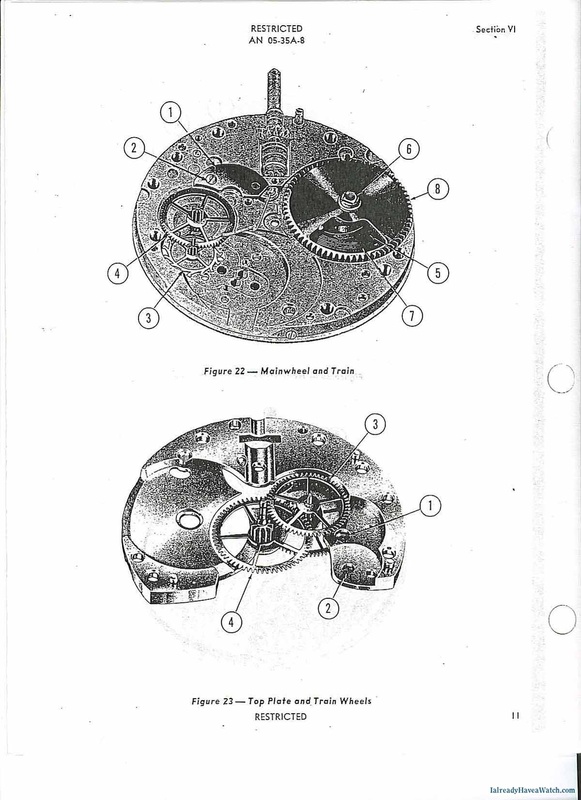 Given that the manufactures were going to modify an existing design, rather that start from a blank sheet of paper, they all started with an existing 15 jewel subsecond movement (the ones used in the Ordnance Department watches) and added a center second pinion with its required rear jewel, so they would wind up as 16 jewel movements (all three A-11 watch manufacturer's had a 16 jewel movement, although there is a later version of the 10AKCSH that is 17 jewels, I think it was done to correct the problem noted above, I do not think it is seen in WW2 watches though). I think people are not counting all the jewels, but because the specs said "15 jewels" assume the movement is a 15 jeweler. What a well-written and informative post, thank you! While the Elgin A-11 pictured in this section is a nice watch, it is not original. The case is an NOS replacement (which is where the hang tag comes from, these show up on ebay from time to time. The hands are NOS replacement, with the second hand being post war (the orginal would have had a blued tail and a slightly longer tip with a bend at the very tip to accomodate the curvature of the dial. In addition, the original band would have been a one piece signed Elgin OD canvas band. The A-11 spec called for a minimum of 15 jewels. All Elgin 539 military movements were 16 jewel, although the train bridges on the gilt movements are marked as 15. The Elgin 539, Bulova 10AKCSH, and Waltham 6/0 - B sub second models were all 16 jewel watches. Some of the rarest A-11's are the early Elgin white dialed models with the Air Corps marked cases. Was this movement also put in a nun,s watch? I have seen some but the winding stem is at the 12 oclock position. sidecross, JATO757, fizzbin1701 and 1 others like this. An excellent topic. Thank you for making it. I'm closing this after deleting off-topic discussions.